Wine tasting at Fenn Valley is both fun and educational. Our tasting room staff is passionate about helping you find the perfect wine or cider based on individual tastes and preferences. We offer 2 free samples or up to 7 for only $5/person. We even rebate the $5 if you purchase 4 or more bottles of wine! And wine club and loyalty program members are eligible for free tastings anytime. 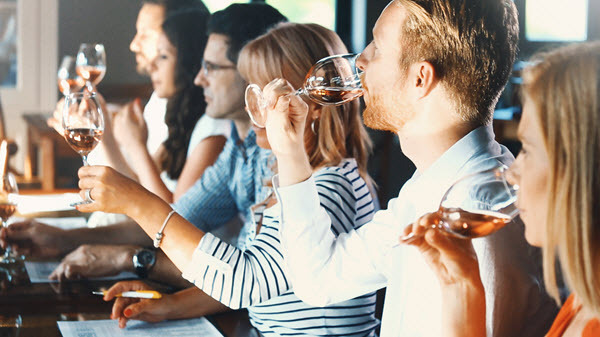 Reserved Tastings – Avoid crowds and lines by booking your wine tasting in advance. Those with reservations are guaranteed a spot at the tasting bar, even on our busiest days. This is a great option for small groups on a schedule. Private Parties – Enjoy a personalized wine tasting in our own private setting. Perfect for bachelorette parties, birthdays, company team building or just a fun afternoon out. The experience is complete with your own private tasting guide and a selection of cheeses and crackers. You will also receive a custom labeled bottle of sparkling wine to take home. Buses – Any bus tours planning to visit Fenn Valley Vineyards must fill out a reservation request at least 10 days in advance of the planned visit.